This illustrated story about a tabby and white cat who is rescued by a neighbor of the author showcases Bernadette Kazmarski’s multiple talents perfectly. Bernadette is a multi-faceted creative spirit: artist, writer, graphic designer, painter, animal advocate, environmentalist. You may know her from her blog, The Creative Cat, or you may have been lucky enough to have been the recipient of one of her custom cat portraits. Bernadette doesn’t just paint with colors, she also paints with words. Witness to a Rescue is a lovely example of this particular combination of her gifts. This charming story, remembered by the author for more than 20 years, will warm your heart as you follow an insistent little stray who has decided that she’s going to be an indoor cat. Even though the story is short, it packs a deceptively powerful punch, and will resonate deeply with anyone who has ever opened their heart to the love of a cat. 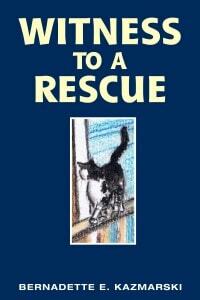 Witness to a Rescue is available for Kindle and in several other e-book formats. To learn more, read my interview with Bernadette Kazmarski, and visit her website. This sounds fabulous, B – congrats! Yay, B……can’t wait to read it. All the best. Kitty Literate. You will love it, Allia! Thanks for the post, I have looked at her portraits but have never visited her site, did it now and fell in love with the sketches! Have a purring weekend. You have a wonderful weekend, too, Maru. We’re big fans of all of Bernadette’s work. Ingrid, thanks so much! Hope you’re having a great time at Meow/Barkworld!